Oceans might not be thought of as magnetic, but they make a tiny contribution to our planet’s protective magnetic shield. Remarkably, ESA’s Swarm satellites have not only measured this extremely faint field, but have also led to new discoveries about the electrical nature of inner Earth. The magnetic field shields us from cosmic radiation and charged particles that bombard Earth from the Sun. Without it, the atmosphere as we know it would not exist, rendering life virtually impossible. Scientists need to learn more about our protective field to understand many natural processes, from those occurring deep inside the planet, to weather in space caused by solar activity. This information will then yield a better understanding of why Earth’s magnetic field is weakening. Although we know that the magnetic field originates in different parts of Earth and that each source generates magnetism of different strengths, exactly how it is generated and why it changes is not fully understood. The magnetic field and electric currents in and around Earth generate complex forces that have immeasurable impact on every day life. The field can be thought of as a huge bubble, protecting us from cosmic radiation and charged particles that bombard Earth in solar winds. This is why, in 2013, ESA launched its trio of Swarm satellites. While the mission is already shedding new light on how the field is changing, this latest result focuses on the most elusive source of magnetism: ocean tides. 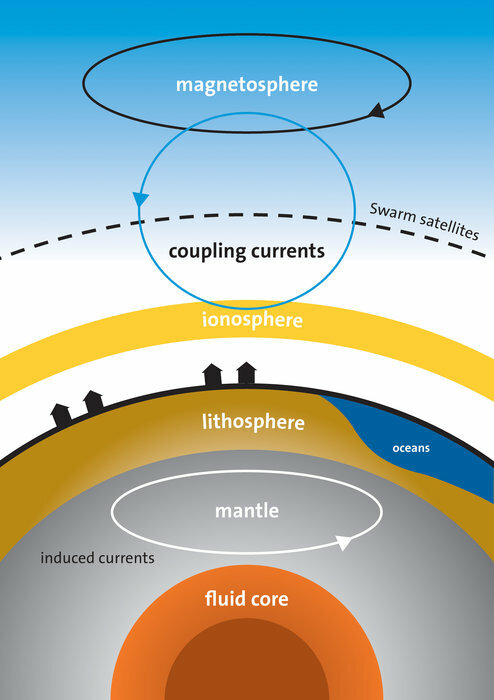 When salty ocean water flows through the magnetic field, an electric current is generated and this, in turn, induces a magnetic response in the deep region below Earth’s crust – the mantle. Because this response is such a small portion of the overall field, it was always going to be a challenge to measure it from space. Last year, scientists from the Swiss Federal Institute of Technology, ETH Zurich, showed that if it could be measured from space – never done before – it should also tell us something about Earth’s interior. However, this all remained a theory – until now. Thanks to Swarm’s precise measurements along with those from Champ – a mission that ended in 2010 after measuring Earth’s gravity and magnetic fields for more than 10 years – scientists have not only been able to find the magnetic field generated by ocean tides but, remarkably, they have used this new information to image the electrical nature of Earth’s upper mantle 250 km below the ocean floor. The different sources that contribute to the magnetic field measured by Swarm. The coupling currents or field-aligned currents flow along magnetic field lines between the magnetosphere and ionosphere. The lithosphere is the rigid outer part of the earth, consisting of the crust and upper mantle, while the asthenosphere lies just below the lithosphere and is hotter and more fluid than the lithosphere. “Effectively, ‘geo-electric sounding from space’, this result is a first for space exploration,” he continues. Swarm is ESA's first Earth observation constellation of satellites. The three identical satellites are launched together on one rocket. Two satellites orbit almost side-by-side at the same altitude – initially at about 460 km, descending to around 300 km over the lifetime of the mission. The third satellite is in a higher orbit of 530 km and at a slightly different inclination. The satellites’ orbits drift, resulting in the upper satellite crossing the path of the lower two at an angle of 90° in the third year of operations. The different orbits along with satellites’ various instruments optimise the sampling in space and time, distinguishing between the effects of different sources and strengths of magnetism. 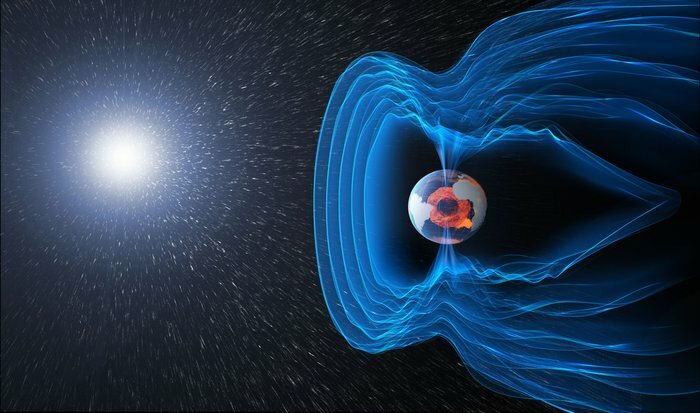 Roger Haagmans, ESA’s Swarm mission scientist, explained, “It’s astonishing that the team has been able to use just two years’ worth of measurements from Swarm to determine the magnetic tidal effect from the ocean and to see how conductivity changes in the lithosphere and upper mantle. “Their work shows that down to about 350 km below the surface, the degree to which material conducts electric currents is related to composition.